The referendum on Scottish independence is provoking political convulsions in Westminster. With polls showing a population inching towards a “yes” vote, it’s clear that minds in London have sharpened by the prospect of Scotland going it alone. Following Cameron’s Olympian carrot-waving last week, the leaderships of all three pro-Union Westminster parties were to be found lining up to brandish sticks. Currency union, declared Osborne – Scotland using the pound after independence – was not an option. Nick Clegg and Ed Balls rapidly agreed, in a touching display of unanimity. It remains to be seen whether the appearance of Moe, Larry and Curly to insist in unison that the pound cannot be shared will have quite the edifying effect on Scottish voters that is intended. But there are very good reasons to suspect that, for all the economic brouhaha, the drive to prevent Scotland managing its own economic affairs is more bluntly political. First, Osborne’s apparent belief that he and the Treasury can simply decree the pound not to be used north of the border is arrant nonsense. Should Scotland wish to use the pound, post-independence, it can, just as it does now; there is nothing at all that can be done to prevent a freely-exchangeable currency being used by anyone else in the world, for whatever purposes they wish, and whatever its issuing authority may want. This is, as a moment’s thought suggests, one of the major advantages to having a currency that can be freely taken abroad: that it can be, well, freely taken abroad. Those in Latin America have had long experience in using the dollar, occasionally entirely replacing the domestic currency. Sometimes this is to Washington’s chagrin. But if dollars can be taken abroad, they can be used abroad. A de facto currency union can be created. The same goes for sterling. It is, of course, possible that the Treasury might decide to suspend free exchange of the pound. Border patrols can be mounted on the A1, perhaps, or bag searches for contraband coinage introduced at Edinburgh Waverley. But since the Treasury’s Permanent Secretary, Nicholas Macpherson, was to be found, barely two months ago, lengthily declaiming the merits of free trade, free currencies, and the Treasury’s historic commitment to both, this seems a little unlikely. That Macpherson is also now busily supplying Osborne with the advice that a currency union can be unilaterally “ruled out” is a fine tribute to that suppleness of mind encouraged amongst Whitehall mandarins. The fact remains: if you don’t want a currency union, you can’t allow free exchange of currencies. There is no other law or regulation that can prevent an independent Scotland continuing to use the pound. A failure to sign a formal currency pact would not prevent an informal currency union still operating. Westminster, for all its blustering, almost certainly realises this. The hue and cry is about the politics of independence, not a dispassionate economic analysis. The politics of independence get us to the heart of the UK’s dysfunctional economy. We are dealing here with political economy: not just how the machinery of the economy fits together, but the all-important question of who benefits from its operation. The political economy question falls into two, mutually contradictory, parts. The first has been touched on, in Macpherson’s note to the Chancellor, and in some of the subsequent reporting. Scottish banks, relative to the size of the economy, are huge. Under a UK-wide regime, RBS and Bank of Scotland (prior to its merger) inflated themselves to eye-watering proportions – as did every other major UK bank. The UK, as a result, is one of the most heavily-indebted developed countries in the world – not, to be clear, because of its government debt, but because of the liabilities of its banking system. On Treasury calculations, these UK-wide banks hold assets equivalent to 492% of the UK’s GDP. Scottish banks, however, have assets equivalent to 1254% of GDP. This is a huge problem: if (or when) banks fail, we now have a well-established expectation that the state in which they are headquartered will bail them out. They are supposedly “too big to fail”, because the wider economic consequences are so huge. The bigger the banks, the bigger the eventual failure – and the bigger the bailout. The Treasury are not slow in pointing out that Iceland, when its own financial system collapsed from 2007 onwards, had banking assets equivalent in value to 880% of GDP. The implication is obvious: you don’t want Scotland to end up a basket-case like Iceland. Stay in the UK. And, if you leave the UK, don’t expect us to pick up the tab. Washington then, and Whitehall today, do not want to carry the can: the difference here, of course, is that the can of was one filled by decisions taken in Whitehall, not Edinburgh. But why, in that case, not simply let Scotland go it alone? The rest of us would have no reason to support Scottish banks in an independent Scotland. An independent Scotland could be allowed to suffer the consequences of its own presumed folly. The process could take some time, but extricating the rest of the UK from Scottish financial institutions is not impossible: bank assets can be allocated geographically, some appropriate consumer protection provided for remaining UK customers, and an amicable agreement reached on separation. This is broadly what the SNP hope for, with a gradual move out of the pound over a transitional period; under the circumstances, it might seem like a reasonable option. This negotiated settlement is, for now, absolutely ruled out by Whitehall as a result of the other major fact in the UK’s political economy. North Sea oil may be in decline, but it still represents an immense contribution to the UK’s export earnings. Depending on whose projections you believe, it will remain a viable source of substantial earnings for at least the next decade – and potentially further. The significance of these earnings are not just the (hotly-disputed) tax revenues they represent. It is the foreign exchange they bring in. Oil is a massive contributor to UK exports, even if, since 2005, we import more than we sell abroad. The figures below demonstrates how important these export earnings are. It shows the current account (the gap between exports and imports) with North Sea oil included, and with North Sea oil excluded. The UK runs a permanent balance of payments deficit – we always buy more from abroad than we sell to abroad. For 2012, this deficit amounted to 3.8% of GDP. This is the highest since 1989, and only the fourth time since 1948 that the deficit has been larger than 3%. With North Sea oil exports removed, however, almost every year for the last decade the deficit has been far ahead of this figure. By 2012, the deficit, minus oil, would have been topped 6.5% of GDP. The balance of payments has been in deficit every year since 1983. We always buy more from the rest of the world than we sell. This position has only been sustained on the basis of consistently flows of capital from the rest of the world making good the difference between exports and imports: in effect, we borrow from the rest of the world so that we can carry on buying their products. The extent of that borrowing has been reduced by export earnings from the North Sea. Oil exports have, in effect, enabled an otherwise very weak international position to be maintained. Remove those earnings, and the international position collapses. But without a high-value pound, the borrowing from abroad that can sustain the trade deficit looks harder to find. A strong pound means high returns from financial assets denominated in pounds; a weak pound, falling in value, threatens those returns. The City of London’s role as a world centre for money-dealing of all stripes is threatened by a falling currency. Absent North Sea oil, and there should be no serious doubt that the pound will be faced with devaluation, potentially on a dramatic scale. As a part of a plan to rebalance the UK economy, creating decent work and removing its dependency on debt, this devaluation would be no bad thing. But as has become abundantly clear since 2008, no such plan exists: the economy will not rebalance, the pound will remain overvalued, and the debt-machine in the City will keep on running – indeed, will grow enormously, if Mark Carney’s aspirations are anything to go by. It’s this, then, that – for now – helps drive the attachment to Scotland. The City needs the oil, since it supports an overvalued currency; and that, in turn, means that a currency union arrangement in which the UK loses Scottish oil revenues, but still has to look after Scotland’s London-regulated banks, is absolutely out of the question. For Scotland, the choices may become more stark. The pound can certainly be kept after independence, but leaving one’s banks in the grip of a City of London regime that has no intention of derisking and deflating those banks is not a long-term plan. Better, if independence is attempted, to have a plan to exit the pound as soon as possible. The Treasury may want us all to shudder at grim tales from the north, but Iceland’s experience over the last few years shows in practice that a small economy with its own currency can allow fat-cat banks to fail while protecting depositors. A managed – rather than chaotic – decline of the Scottish banking system, shrinking it back down to reasonable and useful size, would be feasible if Scotland were not to be attached to the City’s own currency. A new Scottish currency would fall in value over time, as oil reserves dwindled, making a low-carbon transition easier: initial capital equipment imports would be cheap, but new exports would sell more easily. The independence referendum is, in a stark way, beginning to reveal the real lines of power and authority inside the UK. It has the potential to pose a direct challenge to the peculiar political economy this country has developed over the last thirty years. Whatever the outcome of the vote, it is opening up a space to think about alternatives. you may have mentioned it after I stopped reading but the vast majority of RBS is London based activities, and therefore would not, as you said, be counted towards the Scottish economy. RBS is well and truly a part of the London financial parasite. Do you mean the Airdrie Savings Bank? As far as I know that’s the only Scottish bank there is left. Do you mean the Airdrie Savings Bank? As far as I know that is the only actual Scottish bank that is left. All the others that have Scottish in their names are no more Scottish than a nameplate on a door. They have all been sold out to the big boys. The more I get my head around the currency implications for Scotland the more I want out of Sterling. With Scotlands own ‘Pound’ pegged I’m reaching the conclusion the currency to peg it to should not be Sterling. The UK is actually bankrupt and I care. What I don’t wish to see is Scotland sucked into the black hole that is the City of London. The more the British/rUK heidbummers pipe up, the more we talk about them in Scotland and the more we realise we feel the same invigorating sense of possibility. So, please: Cameron, Osborne, Balls, Alexander, Wark and co – keep it up! Each time you speak, another voter turns towards the light side! I thought that a sterling zone wouls have protected the rUK’s balance of payments with oil and gas exports? From that perspective it doesn’t matter what currency is used: if Scotland is independent then Scottish exports will be Scottish exports. The export income will sit on the left hand – asset – side of Scotland’s balance sheet, not the rUK’s. The rUK’s balance of payments in a ‘sterling zone’ and the balance of payments of an iScotland combine into the single sterling balance of payments on an international trade level surely? Is that not the rUK’s gain from a currency union? If not, what is? Yes, they combine into a sterling area balance, but you were talking about the rUK balance. Okay, this is complicated by the fact that the original article conflates issues and makes errors, but I’ll try to keep this short. The section of the article you responded to is right about a union being out of the question from Westminster’s point of view, but it is right for the wrong reason. The big thing rUK loses in the independence/union scenario isn’t oil revenue, it’s the ability to run a large government deficit. A currency union, as talked about by Carney, would involve hard limits on government deficits. The ‘ceded sovereignty’ thing. The article hints at this when it talks about the rUK being unable to bail out Scottish banks in the event of another collapse. It wasn’t oil revenue that enabled the UK government to bail out and take over banks after the crash – the bailout was massively larger than the revenue from oil – it was the ability of the UK government, thanks to having its own currency, to significantly increase the size of its deficit. So, the balance of payments. If Scotland uses sterling that will probably hold its value somewhat higher, due to the effect of oil exports on the combined balance of the sterling currency area. The effect would likely be similar if Scotland uses sterling without ‘permission’. 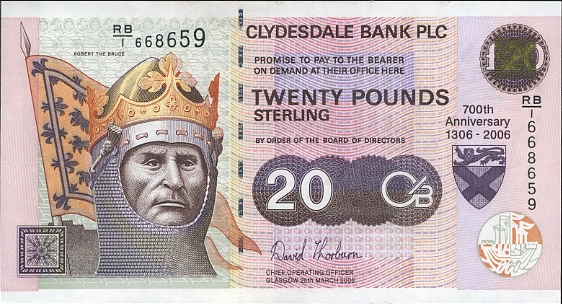 It gets complicated, since markets might have doubts about how long Scotland would use sterling and so on. Does that help the rUK? With oil revenue gone and GDP around 10% smaller, rUK will run a larger external deficit in absolute terms and an even larger one as a percentage of GDP: it’s own balance of payments will shift to a larger negative value than the current UK level. If the government deficit necessary to accommodate that new balance, plus whatever private sector saving takes place, exceeds the fiscal limit set by the currency union, the government and the rUK economy are, to use a technical term, stuffed. The obvious answer to this, apart from “don’t enter the union in the first place”, is to increase exports, thereby improving the balance of payments and reducing the size of government deficit necessary. But in this scenario Scottish exports are holding sterling’s value high, perhaps around its current value, making it hard for rUK to expand exports. None of this is good for the rUK. As for what the rUK gains from a currency union; the answer is, on balance, nothing. There’s the simplified cross border trade from a shared currency, but that advantage also exists, for both countries, if Scotland uses sterling without a union. The disadvantage described above, and its consequences, dwarf the real but small advantages. As far as I know this is wrong. Banks are bailed out by the countries where they operate not where their nameplate resides. I managed to get all the way through it, and there is a thread of truth there but it is so tangled with errors and confusion/conflation as to make the whole article useless. I think it would be prudent for Salmond et al if he organized a media conference similar to the white paper launch- he could invite jim mcColl, Sir James Mirlees, Joseph Stiglitz etc- this may calm some of the hysteria; it would hopefully open honest debate & promote clarity- the televised advice of two nobel economists would certainly focus minds. And possibly the rest of the YES coalition? I agree re the ‘Scottishness’ of RBS and HBOS. The Halifax takeover of Bank of Scotland was fully portrayed as such, with headlines at the time proclaiming Scotland was losing its oldest bank. The operational board was set up in Halifax with one token Scottish member and two thirds of the joint assets assigned to the Halifax, This despite, many years later, most of the ensuing toxic debt being mortgage related. RBS was forced to grow in a dog eat dog regulatory system devised in London. They survived two major acquisition threats themselves and came through as winners of that stupid game. Yet the regulations they operated under, most of their shareholders, and most of their business came from England. Nat West in England incurred the vast majority of the group’s debt. They are now owned largely by the taxpayer. Meanwhile Barclays, while excused from attending the Gunfight at the UK Corral, were at the same time as the HBOS and RBS bail outs, clandestinely, allowed to avail themselves of 650 Billion bail out from the US fed, billions more from the Middle East and billions more from the BoE. And of course, cross border banks in Europe have, in a much more open and transparent way, received credit crunch bail outs from governments in proportion to the amount of business carried out in the respective countries. This pretence that Scotland would have had to fund HBOS and RBS bail outs is a morally bereft lie, but sadly, one which many, thanks to a corrupt media, believe. It would be really great if we could start referring to the US Government bail out of RBS, Lloyds and Barclays. It was bad enough that every single newspaper in the UK didn’t mention it (save the New Statesman) but for nearly every single article on every single pro-indy website about bloody bank bail outs every author fails to mention this. The US Federal Reserve put in nearly 10 times as much into bailing out the UK banks as the UK Government. Banks are simple to handle. On independence, split them up. Force them to hold safe leverage on the retail banking side so that everyday customers are protected (savings, mortgages, personal loans etc) and then the numpties that want to play the markets can all join in with the Casino business banking side and lose all their money if they so desire. This part of the bank will not be bailed out. With typical arrogance Westminster has used the currency union issue to reinforce its assertion that rUK will be the continuing state after Scotland votes YES to independence. Osborne opportunistical ly drove home that assertion in his claim that Scotland has no right to use the £ after gaining independence. The Herald reported that an unnamed source close to Cameron and Osborne later threatened that if Scotland tried to negotiate terms after a YES vote that Westminster did not like, that Westminster would not allow independence to happen. The threat was made based upon Westminster’s arrogant assumption that rUK would be the continuing state and thus able to dictate terms to Scotland. The Scottish Government should be challenging the Westminster claim to be the continuing state otherwise it will continue to be used by Westminster to issue more threats during the debate and also seriously disadvantage Scotland in post YES vote negotiations. James suggests that the pound will devalue without N Sea oil- hard to disagree. But this then implies that the new Scottish currency will be strong, certainly stronger than the new rUK pound and probably versus other major trading partners’ currencies too. Other countries have either responded to this upward push on their currency by allowing it and seeing their reminaing industries destroyed. Or they have taken charge of the revenues, to prevent them entering circulation in the economy and/or using a portion of them to invest heavily in other sectors. This effectively requires nationalisation of the oil industry, or at the very least its production revenues. If anyone believes Alex ‘God Save the Queen’ Salmond is another John Maclean they are kidding someone. So the stupid English parties and the shysters of the SNP will ending up doing untold damage to both economies. Well done. Whatever monetary strategy is adopted, for our benefit primarily, the contaminated Scottish banking system needs reform. Part of that reform must entail the establishment of a National Central Bank. If the Westminster richboy oligarchs do not budge, even after our Yes, then it must now be clearly stated what alternative is proposed. In the meantime the belief that the so-called rUK is the continuing state and sole successor to the previous entity ought to challenged. It is on that premiss that Westminster’s proprietorial attitude regarding sterling is founded: McCrone and Patrick on Today program this morning. Everyone seems to forget that anything Osborne or the other parties say about currency union means nothing at all. When iScotland reapplies to join the EU it will be a condition of entry that we adopt the Euro. the European Commission website indicates the accession criteria. the eventual adoption of the euro is a requirement but in practice there is room for manoeuvre by states. an independent central bank is, however, an essential requirement. Scotland is in the EU, there is no mechanism for expelling a territory from the EU. You are, of course, geographically correct but that’s as far as it goes. Scotland is not a member of the EU, the UK is. Independent Scotland will not be a member of the EU and will need to apply, not even reapply, to join. As well as the inaccuracy over the “Scottish” banks and where they would be bailed out, I was also rather miffed at the low Iceland jibe. Is the author not aware that Iceland, though it was hit hard by the banks’ collapses, has rebounded far faster than the UK, and is once again thriving. They’ve also jailed the bankers who were responsible for the whole bloody mess in the first place. I have never been in any doubt that, when push came to shove with the currency matter, Labour and the Libs would unite with the Tories. They all represent the British State, and that state needs North Sea Oil to function. I also had understood that the convention is for every country that has branches of a bank that fails, to contribute to a bail out proportionally, and, I believe Scotland’s share of the previous bail out would have been approx 0.8 billion, and not the whole caboodle as some pro Unionists have tried to lead us to believe. Maybe we should join the Kroner. Quite a few posters admit that they did not read to the end. What an unusual approach to debate and exchange of ideas! Two observations: Medway, while attacking Osborne and deliberately misunderstanding his rhetorical shorthand (you can’t have the pound = the BoE won’t be and independent Scotland’s lender of last resort), he is essentially saying the same thing: no pound sterling after independence, let’s look at a new currency and the ramifications thereof. These would include a serious shrinking of the Scottish banks (and yes: RBS and HBOS are Scottish banks, head-quartered in Edinburgh, and, presumably being taxed here in an independent Scotland). Medway suggests this could be “managed” by a gradual devaluation of the new Scottish currency. An alternative would be for the banks to up sticks in a more abrupt manner. Either way, there are further – employment and skills – consequences. It’s a real lovebombing article this one + some of the comments. One would think their is a deep fear emanating from Westminster. Can the Fiscal chappies be wrong despite paying tribute to their colossal economic wisdom or have the pages of Bella exposed a vast weakness at the heart of our bid for self determination? Nah …….just vote ‘Yes’ in September and give them a dose of the squits. 1. “Scottish banks”. You can argue that this is an unfair designation – Charles Goodhart, ex-MPC member, has elsewhere suggested that Scottish banks are “in effect” headquartered abroad. Like everything else, however, this is a political issue, rather than one based on logic or justice – as far as the Treasury is (now) concerned, much of RBS and parts of Lloyds Bank Group are very definitely Scottish banks, and therefore a theoretical liability for Scotland (I link to the report above, but for reference it’s here: https://www.gov.uk/government/uploads/system/uploads/attachment_data/file/200491/scotland_analysis_financial_services_and_banking_200513.pdf) You can argue that this is unfair – that the worst excesses of RBS were committed in London under a UK-wide banking regime, and certainly there is a case can be made (as I suggest in the piece) that an independent Scotland cannot reasonably be held responsible for decisions taken under an authority it no longer accepts. But that case has to be made. For now, the fact is that the position of the UK government is that these are Scottish banks and that, in the event of a crisis, they would *not* bail them out, following what it cites as international precedent – however unreasonable this position may be when considering the banks’ operations. Were (under this hypothetical scenario) an independent Scottish government refuse to accept responsibility for these banks and parts of banks, they would simply fail; the threat from HM Government is that Scotland would therefore be an economic basket case, if it cannot afford to bail its banks out. Furthermore, whilst HMG was able eventually to call on what amounted to significant overseas contributions to its own bailouts in 2008, these relied on the globally systemic importance of the City of London, significant commitments from the UK government to also making a contribution of funds, and the UK’s well-developed relationships with other global powers. An independent Scotland would not have the first, find the second exceptionally difficult, and as for third – I would be astonished if some efforts are not being put in by the Treasury and the Foreign Office right now to ensure future support will not be forthcoming from the rest of the world. Scottish banks would, in short, be allowed to fail alone – that is the Treasury’s threat. Now, as Iceland demonstrates (and as, again, I refer to), this inability to bail need not be such a bad thing for a small economy with its own currency. The UK government’s bluff can and probably should be called. It would be better, however, to manage that process of shrinking and derisking, aiming for something along the lines my colleague Tony argues for here: http://www.neweconomics.org/blog/entry/a-bank-break-up-to-revive-the-high-street (It’s worth noting in passing that a genuine localisation of banks would be unlikely to seriously affect useful employment in the sector, with local branches protected and expanded, although no doubt a fair few at the top of the tree would be expected to find gainful employment elsewhere). 2. FlimFlamMan raises some direct issues regarding the macroeconomic balance – not just the balance in the private sector (which is what I largely cover above), but that of the whole economy, including the public sector. I think it is a sensible idea to bring the public sector in but I don’t, in practice, attribute the casual weight he does to the issue. UK public sector debts are certainly substantial, but pale beside the liabilities of its private sector, and particularly those held by its financial institutions. Similarly, the current public sector deficit is significant, but neither this nor the total public debt warrant the excessive concentration that the Coalition government, amongst others, have been paying on them. The dirty secret of the UK macroeconomy is its current account deficit, chronic, now, for decades, and its is around this persistent imbalance that we have to understand how the economy is structured – not the relatively less important issue of the public sector imbalance, however much attention is generally paid to it. The limits to what the UK can and can’t do, economically, are established by its internal balance – not by its public sector position, which (as FlimFlam suggests) has been able to move flexibly to cope with serious shocks like 2008 (however socially appalling the consequences). This is a constraint that won’t apply to an independent Scotland with healthy oil revenues, but will become much the worse for the UK in the event of Scottish independence and the loss of those revenues: it has not been a binding constraint for the last decade or more because of the ability of the UK to mobilise external funding. It is not clear to me that this ability will stretch to cover what will be, other things being equal, a very serious persistent current account deficit, post-independence. I’m not so sure about the issue he raises of “hard constraints” inside a formal currency union, however. These may be written in to a treaty, but they need not apply in practice. Recent experience from the eurozone suggests that whatever efforts are made to constrain independent fiscal authorities inside a currency union, these can (and will) be broken in practice – France and indeed Germany were the worst offenders in this respect, prior to the crash. It was the market perception that the euro was a stable currency that counted far more than the formal constraints in the Maastricht Treaty. Once this perception vanished, as in autumn 2009, crisis erupted. For Scotland, I don’t believe that these constraints would ever be assumed to be binding by financial markets, and they would therefore never apply: a currency union would already be subject to the assumption that it cannot last. That said, although it is not necessarily the case that the same effect operates from currency appreciation as depreciation, recent experience of the pound falling in value since 2008 is that it has had surprisingly little impact on the UK current account position. This points to structural factors that would limit the impact of currency price changes on the domestic economy, in either case – that UK exporters have got used to an overvalued currency (as have, for that matter, UK importers). It is arguable that the response of non-oil Scottish exports to an increase in their exchange rate would also be more limited than might be supposed. Thanks for your response James. You are right that UK debt and government deficits are not a significant problem now, or indeed a meaningful problem of any sort. The UK’s external deficit is not a problem either, all the time it can be financed. They will become a problem in the event of a currency union because then they will be linked. They will be linked due to the loss of flexibility which you agree the UK presently has in running a budget deficit to finance the external deficit. It’s true that the Maastricht limits were first breached by Germany and France, and that the stipulated penalties for doing so were not imposed. Once the so-called PIIGS nations began breaching them though that changed. Perhaps I should say that the constraints are only selectively hard, but they certainly became hard when the contraction really began to set in. And not just breach penalties. The austerity imposed by the troika in return for propping up periphery banks and financing government deficits, while also forcing attempts to reduce those deficits, are about as hard a constraint as it is possible to imagine. Greece’s latest unemployment figures were recently published; an increase to 28%. A week or two before that Spain announced that their unemployment had risen to 26%. What is happening in the Euro zone is the direct result of attempts to meet its budget deficit limits. It is nothing short of a crime against humanity. The way a currency union here has been discussed, including by Mark Carney, it would include government deficit limits, and those limits cannot be expected to be simply ignored. As you say, this would not be a problem for Scotland, thanks to its oil revenue. But it would be a huge problem for the rUK, in part due to the loss of that same revenue. This is why I’m not remotely surprised that Westminster are saying no to a union; they have no choice, even if it aids a Yes vote (which it appears to be doing nicely). Having said that, I’m surprised they’re saying it this soon, or I was, when it looked like it was going to be a clear and unequivocal no. It’s not that though, more a ratcheting up of the ‘unlikely’ language. It all comes down to the linking of two existing, and non-problematic, realities – government and external deficits – such that they create a problem which would not otherwise exist. As for Scotland simply using sterling anyway without a union; it would impose no new deficit constraint on the rUK and so this problem never materialises. A new currency initially pegged to sterling would be equally benign in that regard.